When you live in the best apartments for rent in Sacramento has to offer, you obviously know a thing or two about living the good life. You not only live in an amazing city with awesome people and fantastic businesses, you love spending New Year’s Eve and your city because of the amazing New Year’s Eve Sky Spectacular. For many of us, New Year’s Eve tends to be a dull, boring night where we sit home and watch the ball drop on TV in Times Square. Or maybe you’ll have a few friends and family members over to celebrate the occasion, but it’s ultimately a low key evening for a wide majority of us. Are you ready to finally do something different this year? Residents of Sacramento have an amazing opportunity at their fingertips on New Year’s Eve. They have the opportunity to see a fireworks extravaganza like they’ve never seen before, and since roughly 30,000 people attend this event, it’s definitely going to be one for the ages and something you’d never want to miss. If this sounds even remotely appealing to you, you should definitely attend the admission free New Year’s Eve party and check out the 2018 Sky Spectacular on the waterfront in Old Sacramento. Believe us when we tell you that you will not be disappointed. In fact, the excitement, joy, and smiles on the faces of all those in the crowd will make you feel like you’re on top of the world as you start 2018 off on the right foot. What Exactly Is the 2018 Sky Spectacular? This year, Visit Sacramento is putting on a spectacular New Year’s Eve party and fireworks spectacular at the Old Sacramento waterfront. This event is sponsored by the City of Sacramento, Sacramento 365, ABC 10, Golden 1 Credit Union, Sac Park and Regional Transit. This event was specifically designed for residents of all ages living in Sacramento and the surrounding area. Even though the highlight and main attraction is the spectacular fireworks show that takes place at 9 PM and lasts for 20 minutes, this is actually a party, so there are games, drinks, food, and plenty of wonderful live music for everyone to sing and dance to. The cool thing about this event is many of the local restaurants and fine dining establishments in the area also have a tendency to get in on the act. Even though they aren’t going to necessarily be present at the fireworks display and party, you have the option to visit these local restaurants, bars, and clubs and take advantage of some incredible discounts all throughout the district. 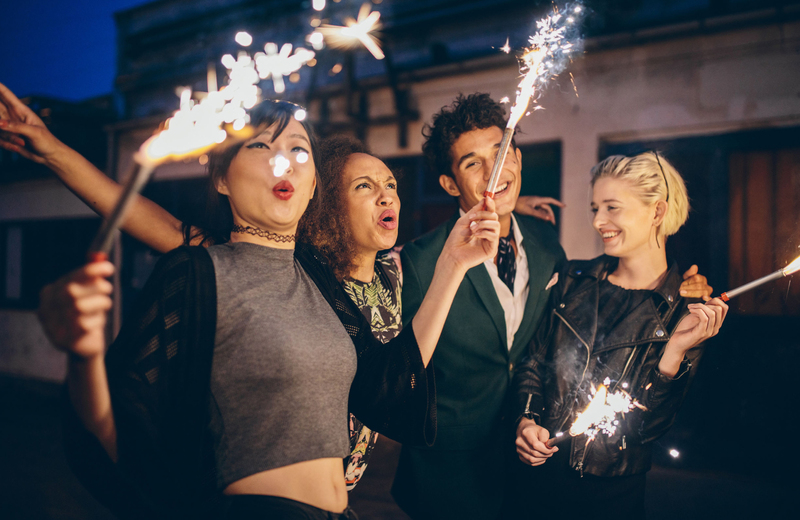 So if you feel like spending a night out on the town on New Year’s Eve this year, but just don’t want to go to this particular party, there are plenty of other places like bars and restaurants that are willing to provide you with an amazing deal if you feel inclined to visit their establishment. The choice is yours so will leave it up to you. What Kind of Events Will Take Place at the 2018 Sky Spectacular? As previously mentioned, there’s so much going on at the 2018 Sky Spectacular taking place in Old Sacramento at the waterfront. So pay close attention if you’re thinking about going to this amazing event, but you just haven’t been convinced as to whether or not it’s the right place to go this New Year’s Eve. To start things off, before we even get into some more of the specifics that are going to take place on the waterfront, it’s important to know that this is going to be a very large, jam packed, crowded event. So if you do not like big crowds, then you may prefer to avoid heading into Old Sacramento on New Year’s Eve this year. On average, it’s estimated that roughly 30,000 people attend this event every year. As you can imagine, that is a very large crowd to say the least. Now, to help put it in perspective, roughly 1 million people attend the annual New Year’s Eve party in Times Square in New York City every year, so it’s obviously a lot smaller than that, but still a very large crowd all the same. Just steer clear of the waterfront in Old Sacramento if you prefer a more low-key New Year’s Eve celebration. Now that that’s out of the way, the first thing we wanted to point out is that this is very much a family-friendly event. Even though the fireworks display doesn’t begin until 9 PM, there are many kid friendly events happening in old Sacramento beginning at 5 PM. So if you plan on bringing your kids, and maybe don’t intend to stay all night long until the clock strikes midnight, you should definitely consider showing up at 5 PM or even earlier because it’s going to be crowded. While we do not know all of the special events taking place for the children this year, we know that live bands are going to be playing music on this awesome and awe-inspiring night, plus there will be magicians wandering around and showing off their amazing tricks, as well as balloon artists, face painters, and other talented professionals. Obviously, the highlight of the show is going to be the fireworks extravaganza. It will begin promptly at 9 PM, and the skies will light up with fireworks for the next 20 minutes after the celebration begins. They truly put on an astounding show, so if you enjoy watching fireworks, you better head down to the waterfront to get a great seat as early as possible. On the other side of the coin, you could technically stay home if you’re in the vicinity of the area. You could just look up at the sky from your backyard, front yard, street, or wherever you are and see the awe-inspiring fireworks display for yourself. It’s going to be an unforgettable time in Old Sacramento this New Year’s Eve. So do yourself a favor and make sure you attend the 2018 Sky Spectacular this holiday season on New Year’s Eve.